It's easy to take your luscious locks for granted and only really notice them when they don't do what you want. I often find myself complaining about a bad hair day when it's just too frizzy that no matter how much product I put in it in the morning, it simply won't stay in place. What we usually forget though is that it isn't just a good hair cut or a lot of styling products that can make or break a look, it's also how you take care of your locks on an every day basis. Humid weather, exposure to a lot of sunshine, intense cold, pollution, styling products and even stress can have a negative effect on your scalp and hair from the roots to the very tips. It's important to nourish your hair so it stays healthy, strong and properly protected from all these elements. Naturalmente is inspired by the healing powers of aromatherapy with its main ingredients derived from certified organic botanicals. 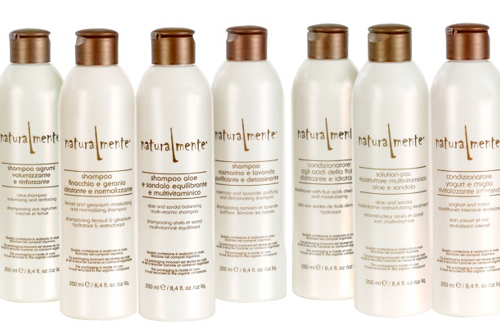 The bio dynamic haircare brand originates from the heart of the Tuscany Hills and its products are petrochemical-free and created from plant-based formulations. For this review I put the rosemary and lavender shampoo as well as the yogurt and millet conditioner to the test, to see if the products really do help nourish hair and scalp in the testing weather conditions that accompany the change of seasons. The rosemary and lavender shampoo has purifying and detoxifying qualities which helps restore the hair to its natural state. The essential oils of rosemary, lavender, eucalyptus and sandal, cleanse and restore the delicate acid mantle of the scalp. After using the shampoo with its refreshingly different scent my hair felt extremely clean and so it certainly achieved what it set out to do. I did find it difficult to apply it to my long hair as the product doesn't lather and so I struggled spreading it out over a large area, but it certainly was worth the effort in the end. Important to note is that you shouldn't use this shampoo on two consecutive washes. The first wash has already stripped the hair of unwanted elements left behind by styling products and pollution and so using it again would risk getting rid of the hair's natural protective oils as well. The yogurt and millet conditioner aims to restore dry, damaged and dull hair. Essential oils of mint, lemon and eucalyptus combined with the yogurt proteins revitalise and intensively nourish the hair and enhance its natural shine. I usually condition my hair after shampooing it, but the products I've used in the past pale in comparison to this one. It started as soon as I opened the bottle as I fell in love with the conditioner's amazingly enticing scent and I really had to force myself to not lick my fingers while I was using it. It was easy to apply, smooth to the touch and massaging the product into my hair and scalp I felt like I was treating myself to a luxurious mask. After washing it out of my long locks they instantly felt thick, healthy and very soft. In fact, while I am used to brushing out my hair after washing it this wasn't necessary after using the conditioner as there were no tangles left at all. And when my hair had dried completely it felt smooth and silky, a pleasant sensation which lasted for several days after use.